This morning's release of Dow Jones S&P CoreLogic's Case Shiller home price indices for December show the nation's home price appreciation slowing down further. The Chicago area's gains also slowed slightly but since the nation slowed down much more it's giving us an opportunity to catch up - relatively speaking. We have now advanced to 3rd from the bottom of the 20 metro area ranking! The nation's single family home prices rose by only 4.7% for all of 2018, which is down from 5.2% for the 12 months ending in November. The 20 city composite slowed to a 4.2% rate in December from November's 4.7% annual rate. However, the Chicago area only declined to a 3.0% rate from 3.1% in November. That places us ahead of Washington DC and San Diego. Las Vegas is still smoking hot with an 11.4% annual appreciation rate! Chicago area condo appreciation is much slower than our single family appreciation - unchanged from November's rate and still at a 4 year low of 1.6%. Looking at the graph below of year over year price appreciation you can see how condo price appreciation outpaced single family home appreciation for years - until about 7 months ago. Chicago area home prices have shown annual gains for 74 consecutive months. Even at the reduced pace of 4.7% per year, home prices continue to outpace wage gains of 3.5% to 4% and inflation of about 2%. Regional patterns continue to shift. Seattle and Portland, OR experienced the fastest price increases of any city from late 2016 to the spring of 2018; in December, they ranked 11th and 16th. Currently, the cities with the fastest price increases are Las Vegas and Phoenix. These are a reminder of how prices rose and collapsed in the financial crisis 12 years ago. Despite their recent gains, Las Vegas and Phoenix are the furthest below their 2006 peaks of any city followed in the S&P CoreLogic Case-Shiller Indices. Basically, he's suggesting that cities that are further behind in price gains are now in the lead. That would also explain why the Chicago area's home price gains are not falling as fast as the rest of the nation right now. 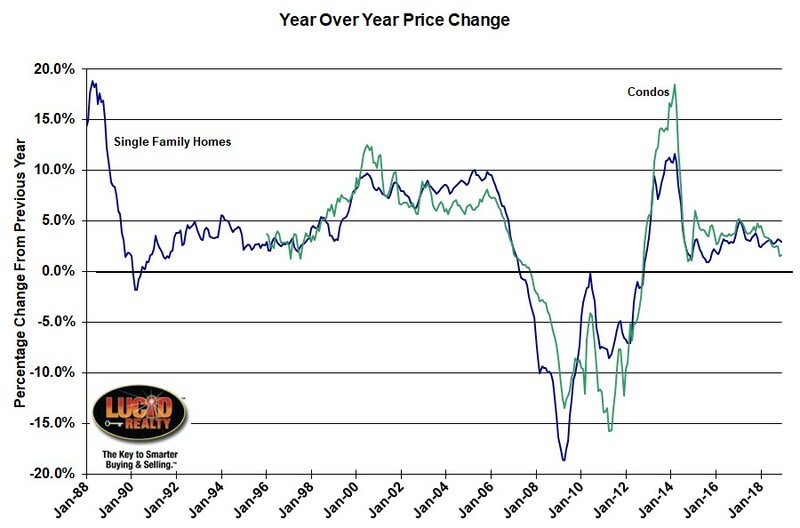 The graph below shows the historic price index levels for the Chicago area's single family homes and condos. At this time of year price levels actually fall a bit so it's no surprise that single family home prices declined by 0.7% from November and condo prices fell by 0.5%. As you can see we have not even recovered to the levels of the bubble peak. Single family home prices fall short by 15.5% while condos are still 8.4% below that level. In fact, single family home prices are lower than they were during the entire period from June 2004 - November 2008 and condo prices are lower than they were from April 2005 - November 2008. However, we have made a lot of progress from the bottom with a 38.7% recovery in single family home prices and a 51.6% gain in condos. 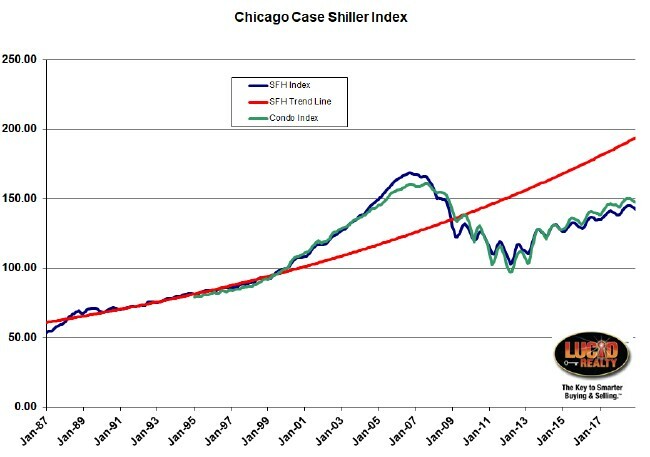 The red line in the graph is the trend for single family home prices based on the pre-bubble period. Unfortunately, the gap between that line and our current price levels is widening, with current prices 26.4% below trend. Growth in metro Chicago just isn't what it once was.